The controversy surrounding “John Walker’s Blues,” the first person perspective song of the American Taliban Walker has somewhat overshadowed the rest of this thought-provoking work. Jerusalem, Earle’s fifth album since his parole in 1994 is filled with musical determination and artistic zeal and his heartfelt songs reveal a prickly conscience that is as outspoken as it is pointed. Informed by the protest folk of Bob Dylan, the fragile rock of Neil Young and the ratty blues of the Stones, Earle’s politicized roots rock distinguishes itself as it makes sharp commentary on the world and especially the US of A, post-911. Lest we forget that Earle is not as one-dimensional as the critics believe, he completes the picture with ruminations on nostalgia (“The Kind”), regret (“What’s A Simple Man to Do?”), encouragement (“Go Amanda”) and a broken heart (“I Remember You”). Personally, crossover artists like Sixpence None the Richer (from CCM to mainstream ‘secular’ pop) used to get up my nose somewhat but I guess I’m getting mellower in my old age – thank God! Produced by Paul Fox – responsible for helming XTC’s Oranges & Lemons, Robyn Hitchcock’s Perspex Island and Semisonic’s debut Great Divide – Divine Discontent is perhaps SNtR’s strongest effort thus far. The rest of the album maintains this level of quality with the dynamic “Tonight” with its sharp rhythmic attack and robust electric guitar design, a poignant and fairly faithful cover of Crowded House’s “Don’t Dream It’s Over” with Nash’s voice seemingly more appropriate than Neil Finn’s (! ), the breezy sixties-inflected “Waiting for the Sun” with its Beatlesque slides and Byrdsy arpeggios, the heartfelt ballad “Melody of You” with its demonstrative orchestral backing and the interesting “Eyes Wide Open” with its austere McCartney-like piano accompaniment. “DIY!” screamed the punks in 1977 but as since the mainstream co-opted the punk aesthetic and turned it into MOR (Blink-182, Simple Plan, Sum 41 anyone? ), it has taken ‘common folk’ like Damon Gough to reclaim the do-it-yourself principle. Gough, of course, is the co-owner of Twisted Nerve Records and most critically the highly acclaimed singer-songwriter-instrumentalist Badly Drawn Boy. With two impressive albums behind him already viz. 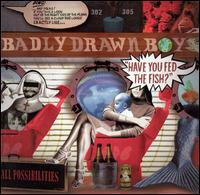 The Hour of the Bewilderbeast (2000) and the soundtrack to About A Boy, Have You Fed the Fish a.ka. All Possibilities finds Gough doing what he does best – his own thing. His eclectic, intricate work contrasts strongly with the slacker image he has lovingly crafted since his debut and betrays an affinity for the pop masters – Bruce Springsteen (an avowed personal favourite), Harry Nilsson, Lennon & McCartney, Ray Davies, Paul Weller – all clearly evident on this excellent sophomore effort. Less baroque than its predecessor, on Fish, Gough expands his palette considerably to include luminous disco (“All Possibilities), old school rock (“Born Again”), jaunty pop (“You Were Wrong”), vibrant R&B ska (“The Further I Slide”), Lennonesque ditty (“Imaginary Lines”) and insistent soul (“Using Our Feet”) alongside his usual excursions into heartland rock balladry eg. (“Have You Fed the Fish,” “40 Days 40 Nights” and “How”). It is impossible to listen to this posthumous album without getting teary eyed. It is still difficult to get used to the fact that half of the Beatles is no longer with us, more than a year on. Unlike Milk and Honey, the tracks collected on Brainwashed are more than mere demos and thanks to the loving labour of co-producers with George (we’re always on first name basis with the Beatles, y’know) viz. his son Dhani Harrison and old friend, Jeff (ELO) Lynne, turn out to be some of the best material from Harrison, bar Cloud Nine, since the early 1970s. With stripped down production values (thankfully, Lynne maintains a light touch throughout) and fine attention paid to guitar details, Brainwashed never attempts to be more than it is, a tribute to the music that represented the life and times of George Harrison.